In the new millennium, religion, its relation to the state and mutual respect are hot-button issues across the globe. In Flushing, Queens, this conversation started 350 years ago with a document called the Flushing Remonstrance when the Quakers fought for religious freedom against the imposed Protestantism of Peter Stuyvesant. 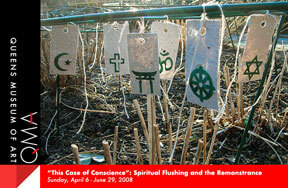 In the Spring of 2008 the Queens Museum has a whole new take on the question of religious pluralism in Queens. Embracing the notion that art can and should actively address and engage contemporary issues, QMA invited five contemporary artists – Emmy Catedral, Takashi Horisaki, Sara Rahbar, JosÃ© Ruiz, and Tattfoo Tan – to partner with religious institutions in Flushing to create works that respond to religious dialogue and exchange. Components of each project were exhibited both in the Museum and in Flushing at participating religious sites. 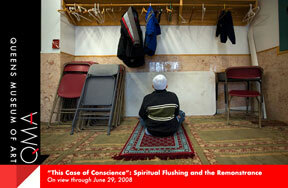 Kim Badawi, Islam in Flushing Queens: Young boy during day-time school, 2000. Color photograph, 13 x 19 in. Courtesy of the artist. In additon four four documentary photographers — Kim Badawi, Jenny Jozwiak, Stephanie Keith, and Scott Lewis — were invited to captured the religious diversity of the Flushing community through their compelling works. Last, but not least we had an open call to photographers – professional, enthusiasts, and even our own digital photography class students – to particapte in the documentation project, resulting in over 130 images capturing the spiritual pulse of Queens.